Does This Dress Make Me Look Pregnant? All of the above. (Can you tell I had fun looking up phrases for pregnant? Up the duff was another strange one.) There seems to be a sewing blogger baby boom going right now. This little bump actually just appeared this week. I swear it showed up overnight. I'm hoping I'm beyond the point of did she eat too many doughnuts or is she pregnant? Lol. I do love a good doughnut. All silliness aside, I am over the moon about being pregnant. J and I are so excited. We actually discovered I was preggo two days before we left for St. John back in August. That was an interesting plane ride, which is a long story for another day. I've spent the last couple of months giggling for no reason and oohing and ahhing over all sorts of tiny things. I'm seventeen weeks along right now. Little one will be here in early April. We can't wait. The only down side of being pregnant is the tiredness. I knew it was a side effect, but I had no idea how extreme my fatigue would be. Hence the lack of sewing and blogging around here lately. I get home from work and crash on the couch. I've been enjoying taking it easy. No guilt here. I go to bed super early. I'm trying to get in all the sleep I can now. And I've read quite a few good books in my down time (not just baby books!). But I did finally manage to finish a dress. And it's a dress that will see me through my pregnancy, no less. I made up McCall's 6553. I know this dress is not everyone's cup of tea, but I'm in love with it. 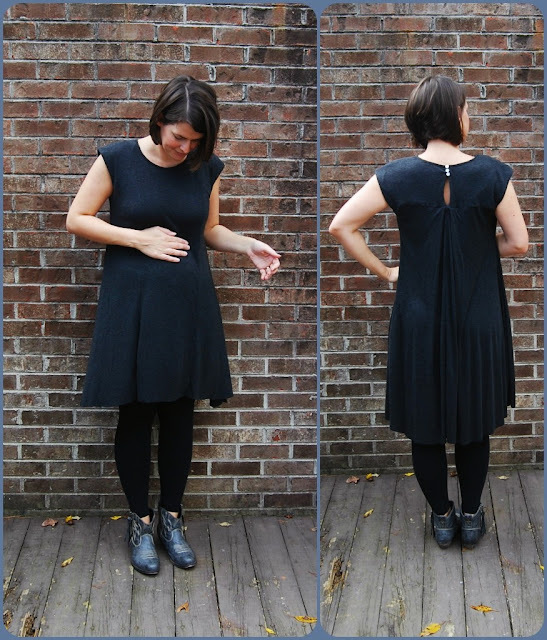 I actually had plans to make this dress long before I was pregnant in a lightweight drapey linen. I know this pattern has received a fair bit of criticism of just being a big sack. But Sallie's blue ikat dress and Ginger's lovely version convinced me otherwise. Both ladies look fantastic in their makes. Ok, ok, so on me it is a sack. But I think it's a sack with a really nice shape. The pleat in the back gives it such unique volume, though I'm not sure it translates well in a knit. The high low hem makes it modern. This is not your ordinary sack dress. 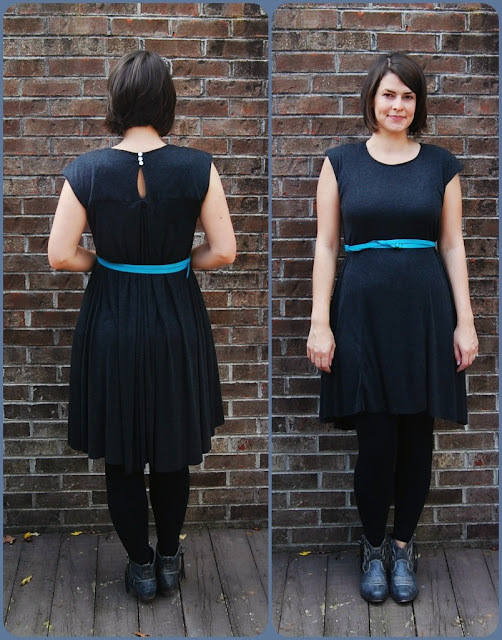 After discovering I was pregnant, I bumped up this dress in my sewing queue. I decided I wanted to make it in a knit for extra growing room. The pattern claims it can be made in double knit. I rebelled and chose a super soft modal knit from my stash. Maybe not the best choice because it was a pita to sew. But boy is it comfy to wear now that I'm finished. I went down two sizes- one because I knew there was a ton of ease in this pattern plus another size down because I was using a knit. I probably should have gone down one more, though the knit I used is crazy stretchy. I ended up taking it in under the arms almost two inches on each side tapering to the pockets. I skipped the belt and belt openings. I also just sewed the top of the keyhole closed and put three pearly white buttons there. I have two more buttons left that I may add. I had some trouble where the back yoke pieces meet with the pleat. The knit I used made the pleat extremely heavy. I tried to stabilize it with some hand stitching, but you can see the pull there anyway. There is some wonkiness where I slip stitched the facing to the yoke. The facing was interfaced with a fusible tricot and never quite matched the shape of the back yoke piece. C'est la vie. There is no hem. I tried to hem it, I really did. All of my attempts were ripply and wavy. I had to cut off the bottom inch and leave the hem raw. It's as even as I could make it. Any suggestions for hemming a very stretchy, soft knit? The silhouette is so different for me and I was really surprised by how much I like it. I had a moment during the process where I thought it looked like Amish pajamas, if there is such a thing. Maybe that's what you're thinking right now, lol. I love that I have lots of choices with this dress. It's like a blank canvas. I'll probably wear it with leggings and a cardigan most of the time. But if I need to dress it up, I can put on some heels and a pretty necklace. I think I actually prefer it without a belt. And thanks so much for all the great advice about thread from my last post. I'm actually pretty confident in the longevity of Coats and Clark now, but I'm going to try out a few other brands to see what my machine likes best. A week or two ago, I read a fascinating blog post on thread and wanted to share. Nancy, who blogs over at Owen's Olivia, did an awesome write up about visually understanding thread quality. She did a comparison of pictures taken under a microscope of various brands of thread and I was totally intrigued. Seeing the lint (or lack of) and twist close up was so helpful. I borrowed one of her photos below. I highly recommend checking out Nancy's blog, btw. She sews like a pro and writes about her fabulous home decor projects and other various craftiness. I love a bit of home sewing myself. Anyway, I was really interested in this particular post on thread because I never really took thread choice seriously before. I mean, I know the good quality stuff is better, of course. But I kind of scoffed when a coworker who also sews told me she'd never use anything but Gutermann thread on her projects. I didn't think it made that much of a difference. I've always used Coats and Clark polyester all-purpose thread. Partly because it's cheap and readily available where I shop. But mainly because someone gave me a gigantic bag of it when I started sewing three years ago. I mean gigantic. The bag must have had about two hundred spools of thread in it. I've yet to make my way through it and I rarely buy new thread- only when I don't have a particular color. I started thinking back on some things I've made in the past and how well they've held up. I even examined a few of my older items closely. A couple of tops I've made with super cheap knits have holes at every spot the thread hits around the neck binding. I've always chalked that up to the cheap-o knit, which still could be the case. Or too big of a needle. But another top I made out of a woven shirting has started coming apart at the collar and cuffs. Is that because I clipped my seam allowances too small, or is it because I used cheap poly thread that has worked it's way through the fabric? So I'm curious, sewing friends-- what sort of thread do you use? And do you really think that thread quality can affect the short term longevity of something you've sewn? I say short term because most of the time when I sew, I'm not making something I want to last forever and ever. I want it to last, but not as an heirloom item or anything. And does thread quality matter when you are using cheap fabric? The more I sew, the more expensive the fabric I buy. But I still sew with cheap stuff now and again. 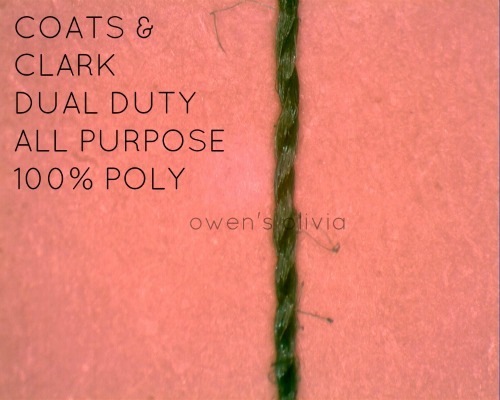 I'll be honest, I'll probably keep on using my Coats and Clark thread for most things because I have so much already. Unless y'all tell me otherwise. But I think I'm going to splurge on some nice thread for the winter coat I'm planning on making here soon. Maybe I should not take thread choice so lightly. Also, cotton thread versus poly thread? Is it necessary to use cotton thread with cotton fabrics and vice versa? I want to know your thoughts on thread. Do tell! Hey friends. I'm still here.